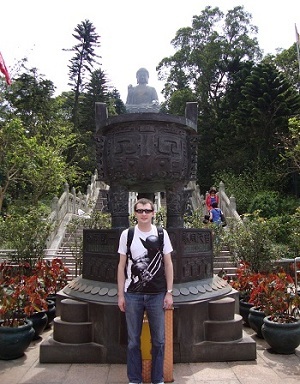 The Tian Tan Buddha, also known as the “Hong Kong Big Buddha” or “Po Lin Buddha,” is the world’s largest outdoor seated bronze statue of Buddha. It’s one of the most popular tourist attractions in Hong Kong. The whole statue of the Tian Tan Buddha consists of 202 bronze pieces, stands 34 metres tall, and weighs over 250 tonnes. The statue took 12 years to build and was completed in 1993. The base of the statue is a model of Tian Tan, the Temple of Heaven found in Beijing. 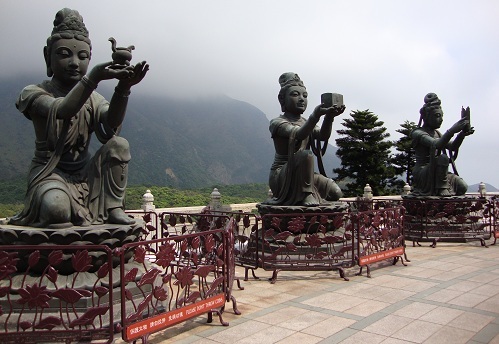 This is where the name Tian Tan Buddha comes from. To get to the top of the mountain that the Buddha statue is on, you’ll have to walk up over 250 steps! This is quite a long and tiring hike. My wife and I had to stop and rest about 3 times before we got to the top. It’s a good thing they have lots of resting points as you walk up the stairs. Every 20-30 stairs has a large step that can be used as a resting point. Once we reached the top we could really feel the work out we had given our calf muscles. When you get to the top of the stairs, this is the perfect opportunity to turn around and look at the great view at the top of this mountain. From up here you can see the Po Lin Monastery, Lantau Peak and Ngong Ping Village. Once you’ve caught your breath, take a walk around the lower level. You’ll find 6 bronze statues (called Devas) surrounding the giant Buddha, offering different items to him. Go up to the second level where you can walk through a museum with paintings and ceramic plaques which depict Buddha’s life and his teachings. You can walk up the rest of the stairs that lead up to the Tian Tan Buddha and get a close up picture of you below Buddha if you like. There are certain spots inside the building with signs that say “please do not take pictures.” Be respectful and put your camera away. You don’t want to offend anyone. 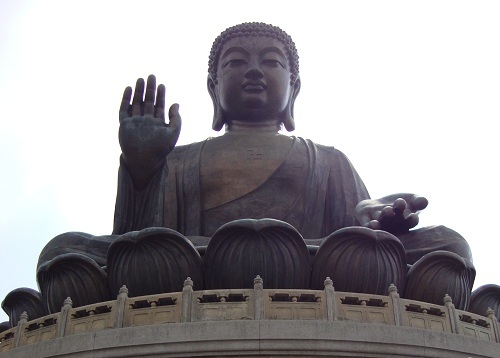 The busiest time of the year at the Tian Tan Buddha is on Buddha’s Birthday. This day falls on the 8th day of the 4th month of the Chinese Lunar Calendar (usually occurs between the end of April and the end of May). If you like huge, lively crowds you may want to plan to visit on this day. Otherwise you would be better off not going on this day. If you do end up visiting on a busy day, priority entrance into the big Buddha building will be given to people who have meal tickets to the Po Lin Monastery vegetarian restaurant. You may want to purchase a meal ticket so you can get in. There is no meat or alcohol allowed on the premises. There is only vegetarian food available here. If you want to eat some meat or have an alcoholic drink, you can walk to the nearby Ngong Ping Village and do so in one of their restaurants. 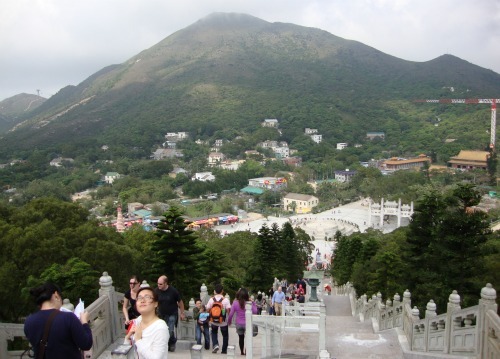 The Tian Tan Buddha has an alternate route for vehicles to bring handicapped people up to the top of the mountain. There are a few options available for getting here. You can take the MTR to Tung Chung MTR station and ride on the Ngong Ping 360 cable cart to Ngong Ping Village. From Ngong Ping Village, it’s just a short walk to the Tian Tan Buddha. There are also a few bus routes at Tung Chung station that will take you to and from the Hong Kong big Buddha. Nearby attractions include the Po Lin Monastery, Ngong Ping 360, Ngong Ping Village and Lantau Peak. Hong Kong Disneyland is only 1 MTR station away from Tung Chung MTR station. If you take a bus or cable cart ride back to Tung Chung MTR station, you’ll be very close to the Citygate Outlets and the Hong Kong International Airport. If you have a long layover in the Hong Kong International Airport, you could easily take a day trip out here and make it back in time for your flight. Nearby hotels include the Hong Kong Airport Hotels, Disney’s Hollywood Hotel and Hong Kong Disneyland Hotel.